Mobile editing on a cell phone has become a real alternative now that equally portable storage systems are available. When I wrote about Luma Touch’s amazingly powerful $20 editing app for iOS called LumaFusion last month, the editor using it on his Apple iPad, Josh Turchetta, was storing his 4K video on a series of SD cards, which was a clever but somewhat awkward solution. As a sign portable NLE technology is maturing, two new wireless mobile storage systems are now available that could make the concept of needing a permanent edit bay installation obsolete. The first solution comes from our friends at Western Digital. This company has been building storage since 1986 when it introduced the WD33C93 single-chip SCSI (Small Computer System Interface) used in the first 16-bit bus mastering host adapter. 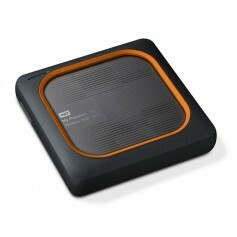 The My Passport Wireless Pro spinning disk version is available with 1-4 TB storage. The My Passport Wireless SSD drive comes in 256 GB - 2 TB models. Each drive provides wireless 802.11ac Wi-Fi connectivity and an SD 3.0 card slot to get video in and out of storage, although you can also use a USB cable. Then, built into the LumaFusion editing app is an interface for the Western Digital storage, enabling the transfer of even 4K video at up to 400 MB/s depending on your iOS device’s Wi-Fi connection speed. The video from the WD drive always comes in at the same resolution that you decide to edit it at, and once it has been cut and finished, it gets exported back to the WD storage at that same resolution. 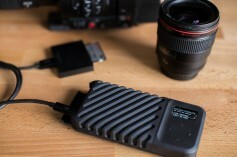 The combination of portable NLE and storage turns an iPhone into a 4K-capable iPhone editor. Ottrey noted that WD was happy working with Luma Touch to create a multi-stream solution for mobile editing that comes without the costs, security risks and Internet connectivity requirements of cloud storage. These Western Digital wireless drives are available now. This wouldn’t be a maturing section of our post production community without competition, and some west coast contenders are giving it just that. On April 3rd, California group called gnarbox launched a Kickstarter campaign to upgrade their first-version SSD to a 2.0 version and smashed through its $75,000 goal in 39 minutes. 3 months later, the campaign closed at over $900,000, indicating their customer base really had faith in mobile editing. The gnarbox 2.0 mobile storage drive can transfer files wirelessly and also interfaces with Adobe Premiere Pro CC, Final Cut Pro X, Adobe Lightroom, and Dropbox. The gnarbox 2.0 uses an Intel Quad Core, 2.40 GHz CPU, NVMe (Non-Volatile Memory Express) controller interface to SSD storage holding up to 1TB with USB-C backup running at 400-500 MB/sec read/write speeds. The drive works just fine with the LumaFusion app, and it can also interface with Adobe Premiere Pro CC, Apple’s Final Cut Pro X, Adobe Lightroom, and Dropbox. “One advantage our gnarbox 2.0 has is that when downloading source video to a system like LumaFusion you only capture the part of a clip you are actually using in the edit on your timeline. gnarbox 2.0 is scheduled for delivery in December 2018.